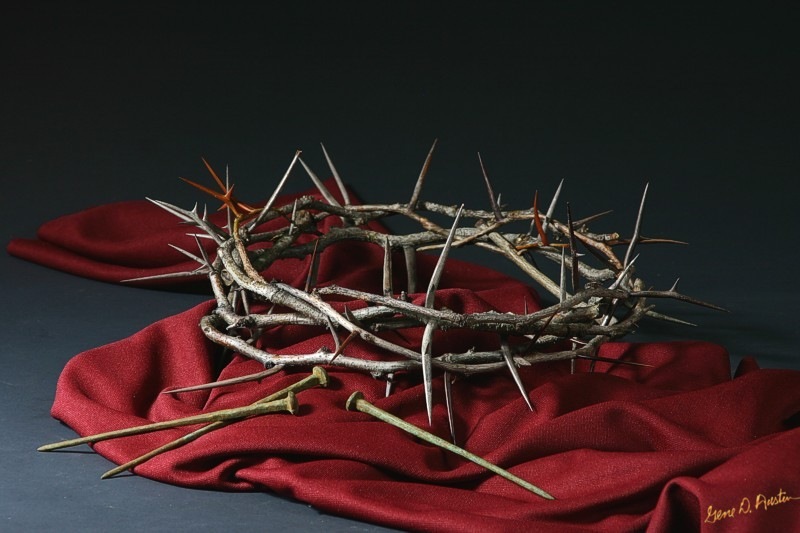 Description : I had the idea for the Crown of Thorns picture for several years. After seeing a business card with a similar picture, I was inspired to begin work on my idea. After trying to find a crown of thorns and not finding any to my liking, I decided to make my own. I went to a nearby farm where I had seen some Locust trees growing and asked the owner if I could clip some. He was very accomidating and said simply, "Be sure to close the gate behind you." After a short distance, I discovered a Locust tree with it's thorned branches hanging close to the ground, found the piece I was looking for, and using a large cutter I cut off some long branches. When I got home, I took a board and hammered in a round row of large nails. I then intertwined the Locust's thorny branches around the ring of nails, forming a crown. In working with the thorns, I stuck myself several times. Even though I had on gloves, it was very painful, and caused me to think about how the suffering the crown of thorns would have actually felt on Christ's head. I set the newly formed crown out to take shape and dry for several months. One day I received an ancient artifacts catalog in the mail. Thinking it was junk mail, I threw it out but went back later, took the catalog out of the trash and set it on my kitchen counter, where it lay for several weeks. One day as I thumbed through the Catalog, I came across an item listed as "bronze roman crucifixion nails,100 BC to 100 AD�. I called the company and they confirmed they were the type of nails I was looking for. They were asking $99 for each nail. I ordered three. I tried various lighting techniques to get the desired effect, and created the photo. This photo has much meaning to me that somehow I cannot explain. I hope you enjoy viewing my Crown of Thorns as much as I did creating it.